Can Nuclear Power Take The Heat? France is being forced to import electricity from Britain to cope with a summer heatwave that has helped to put a third of its nuclear power stations out of action. With temperatures across much of France surging above 30C this week, EDF’s reactors are generating the lowest level of electricity in six years, forcing the state-owned utility to turn to Britain for additional capacity. Fourteen of France’s 19 nuclear power stations are located inland and use river water rather than seawater for cooling. 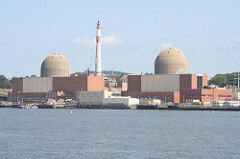 When water temperatures rise, EDF is forced to shut down the reactors to prevent their casings from exceeding 50C. These summer shutdowns are becoming more and more common, and don't bode well for the future, given that temperatures in Europe have been creeping up faster than the global average, according to a recent European Environmental Agency report, and will almost certainly keep climbing as the world warms. Some countries, like France, Germany, and Spain, have responded to this problem in the past by overriding their own environmental laws and allowing plants to dump hotter water into the rivers—the downside is that this can cause considerable damage to river life. Nor is this just Europe's problem: In 2006, Exelon had to cut the power at a nuclear plant in Illinois when the Mississippi River got too warm to be used as cooling water. According to the recent NOAA synthesis report on climate-change impacts in the United States, one of the things we can expect to see across the country in the coming decades is a much greater frequency of hotter-than-90F (32C) days—precisely the point at which France's plants keep running into trouble. Meanwhile, as the AP reported last year, if droughts become more frequent, that could mean additional trouble for nearly one-quarter of the nation's nuclear plants. In any case, it's not clear what the ideal solution is here. Last year, when this problem cropped up, Lisa Stiles of the Nuclear Energy Institute listed three possible responses—relaxing the environmental rules on heat discharge, building bigger heat sinks (cooling towers, say), or building smaller plants. The latter two, however, would presumably add to the cost of nuclear energy. Now, Stiles's makes a fair point that all energy sources have problems and that this is hardly a fatal blow for nuclear; still, it does seem to be a growing headache.